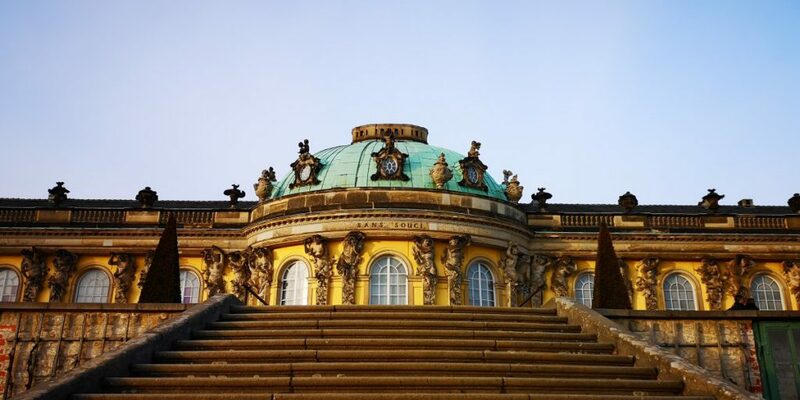 If there is one perfect day trip destination for people who just need to see Potsdam, it is Potsdam. For anyone in Berlin who wants to look at stunning sightseeing spots without actually being in Berlin, Potsdam is just the right place. Yes, Potsdam is part of the Berlin metropolitan region. It is its sweet spot. Potsdam is the marmalade in the bagel, the chocolate chip in the chocolate chip cookie, the cherry on top of the tart, the raisin in the muesli. Potsdam is great. Let’s say it together: “Potsdam!” Louder. “Potsdam!” Some more conviction, please. “Potsdam!” Yeah! Did I hear Potsdam? “Potsdam!” Alright! Potsdam, the capital of the German province of Brandenburg, is Berlin’s Moon. At least it keeps on circling around the big planet like crazy. Getting there is easy as pie. The Berlin S-Bahn city train does it in 38 minutes, regional trains in 25, from Berlin’s central station. Yes, you can reach Potsdam by car in half an hour, unless you are already there. It accommodates Studio Babelsberg, the largest film studio in Europe. All movies you know by heart, including “The Bourne Ultimatum”, “Inglourious Basterds” and “Cloud Atlas”, were shot right here. Since 1912, motion pictures of all kinds have been filmed, edited and produced in Potsdam. To many day trip enthusiasts, the first impression is Potsdam’s train station, which is actually an all-in-one location. It is a central station with a built-in mall, but it has a cinema and millions of food stands too. Don’t get tempted. You just got here, for Christ’s sake. Now the secret is to cross the Havel river and one of its channels via the Lange Brücke. Doing so by bus or tram takes about 90 seconds. It makes sense to head straight for the first historic building you already saw when you left the all-in-one train station, which is the Lutheran Church of St. Nicholas. The church is located right at the ‘Alter Markt‘, or Old Market. While the temple is a stunning sight itself, wait until you stand on top of its tower. It is worth it. Purchase a ticket from the funny guy at the counter inside the church and find your own way up the narrow circular stairs. The author of these lines thought he was going to get stuck with his 105 kilos. From up there, the view is great. But do not stay too long since there is a lot more to see. The Old Market is interesting also because it shows how the communists in the former GDR built their ugly 1950-s apartment blocks right into the square. Then, the Landtag‘s (provincial parliament) yard is a good spot to visit for awesome photo opportunities. Shoot the church through the gate, shoot some selfies, shoot everything you see. Brandenburg’s state parliament, the premises of which you are standing on right now, is very emancipated. Its left-wing majority just voted for a gender quota for MP candidates. Say hi to the Polish fast food pizza guy when you hit his place on Friedrich Ebert Street, a nice pedestrian zone which leads straight to the Gate of Nauen. And try not to get run over by a tram while photographing Mittelstrasse with its red clinker houses. By now, the city trip travel party has already inhaled a lot of Potsdam’s beauty, but the most stunning part has still not been covered. Making a left behind the Gate of Nauen might be a good idea, because Hegelallee leads to the one place everyone comes here for in the first place, which is the Lustgarten state park. It probably accommodates more palaces and other attractions than Disneyland. We took a deviation via the elegant Brandenburg Gate. No, not the one in Berlin because that is not where we were. 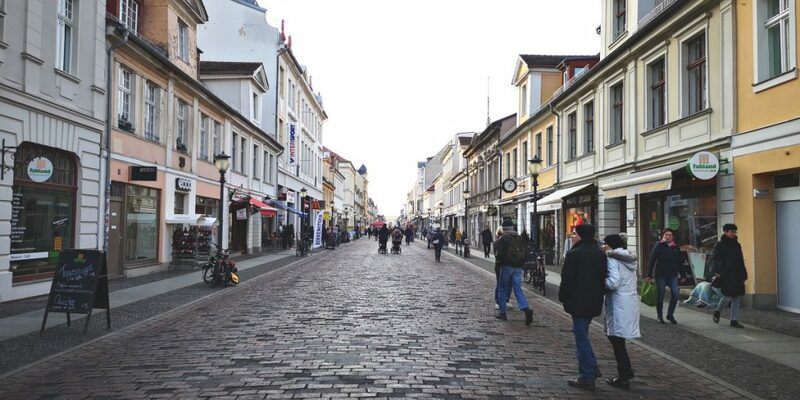 Potsdam, remember? Then we approached the park from the south. A golden gate marks the entrance to this huge park which does look nice in February. But coming here in spring probably makes even more sense. While taking pictures of duckies and swans on frozen ponds, we spotted Sans Souci on the horizon. The palace appeared behind its countless glass cabinets used for growing grapes. Squeezing through crowds of tourists from China, Japan and a city called Berlin, we managed to get some incredible views and shoot some killer shots. O.k., we shouldn’t have picked a Monday because that is when the palace is closed. 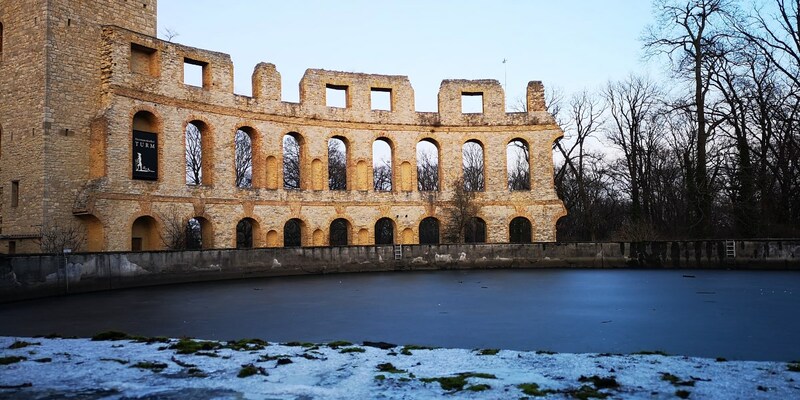 Skipping the Neues Palais, another palace, since it was already getting dark, we felt the inner need to look at the ruins on Ruinenberg hill, where the walls of the Norman Tower, partially hidden behind a water basin, turn out to be the next of a million of perfect photo objects in Potsdam. In the age of film cameras we would have wasted at least three films on this one alone. The bus trip back to Potsdam’s central station gives the distinguished traveler another nice view of the city. Will we return to Potsdam? What kind of a question is that? Yes, we will grab every opportunity. We will come in spring, in order to see everything we missed this time around, for some more afternoon walks and photo ops. If Potsdam wasn’t already there, it would have to be invented and built. 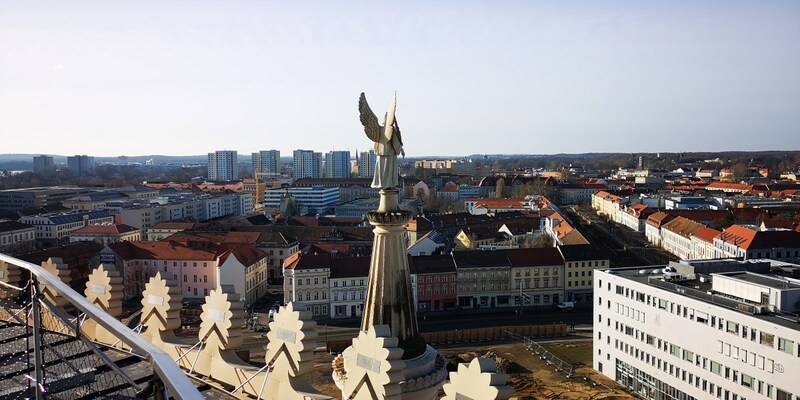 It is probably the richest city in the area of the former GDR, and a very successful one. The film industry is only a fraction of it all. The trip back to mother Earth with aching legs on a regional double-decker train leads straight to Friedrichstrasse station. What will we dream of tonight? Potsdam, the nicest part of Berlin which is not actually Berlin. The cherry.